If you’re following along with the Mastery Challenge you’ll know that September’s challenge is to make a fruit butter. If you are more of a apple butter person, we’ve got a few of those recipes too. We also wanted to introduce you to CanningCrafts, our partner for our giveaway. CanningCrafts has been selling colorful, canning jar labels since 2010, and we just love their products! 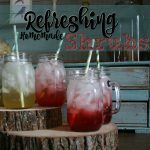 They have over 300 products that include custom labels, cloth covers for mason jars, hang tags, and DIY cookie mason jar gift sets. 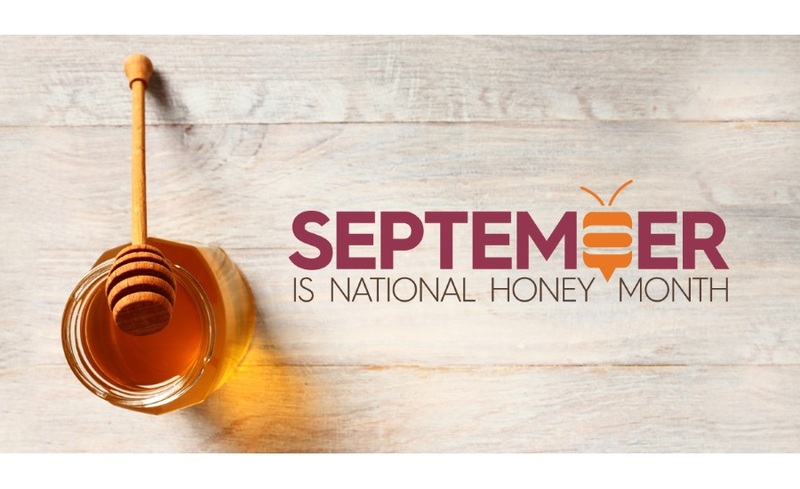 They create customized honey labels for backyard beekeepers, which is what made us think of them for National Honey Month. CanningCrafts selection of ready made and custom mason jar labels are perfect for dressing up the mason jars in your own pantry, or to give to friends and family! We fell in love with this Vintage Honey Bee Canning Label. Since you can customize it yourself, we thought it would work perfectly in a variety of ways. Beekeepers can use it to label jars of honey. 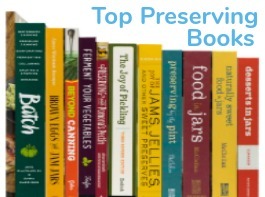 Preservers can use it to identify honey sweetened preserves. CanningCrafts is giving two lucky winners 5 sheets of labels (2o labels per sheet). We are also throwing in a $50 store credit to Fillmore Container for each winner. You can enter to win at the end of this post. 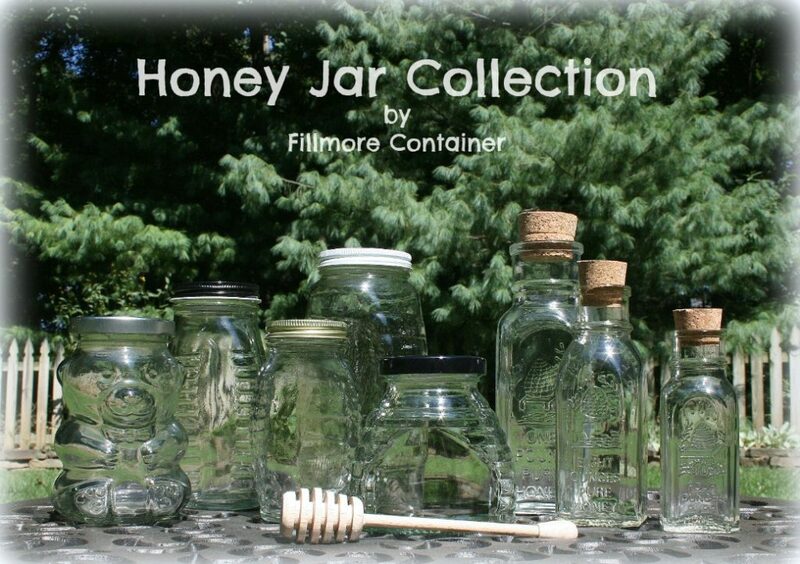 CanningCrafts is also offering Fillmore Container’s readers 10% off all honey labels until October 15, 2017. Just use coupon code: BizzyBeeFC at check out. 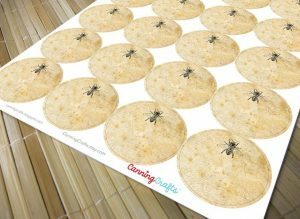 Two lucky winners will each receive 5 sheets of Vintage Honey Bee Canning Label from CanningCrafts AND a $50 store credit to Fillmore Container. Enter to win below. Don’t forget – CanningCrafts is also offering Fillmore Container’s readers 10% off all honey labels until October 15, 2017. Just use coupon code: BizzyBeeFC at check out. I’d use them on my homemade lemon curd jars. This Ginger Honey Pear butter sounds amazing!! I will be making some of this with the 2 boxes of pears I just got! I love the labels, brilliant idea for sticking them to the lids (why didn’t I think of that 😉 )!!! I would use these for customized Christmas gifts of canned preserves. Thanks for the giveaway! 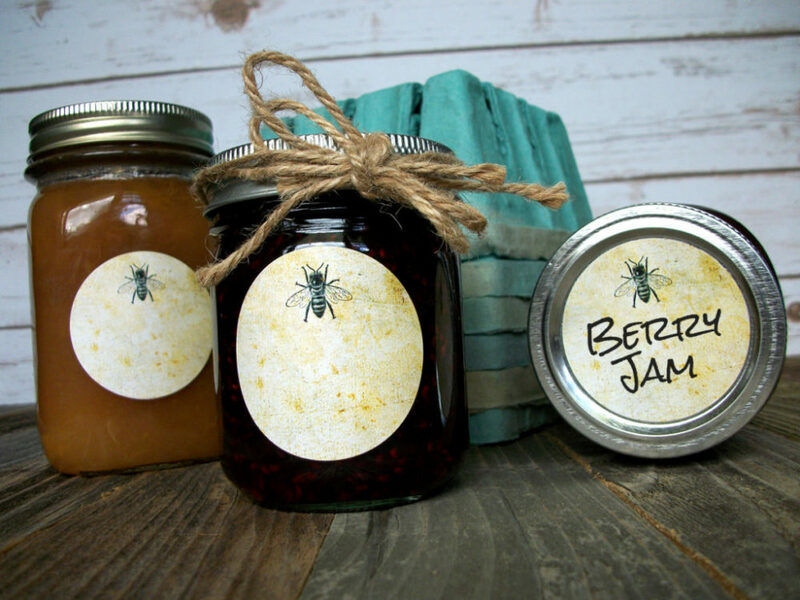 I would use the labels for blueberry jam made with honey. I’ve been making a pear butter for years….so good on pumpkin bread! Would love to win the labels and store credit. Your jars are the best! I haven’t canned in two years. So sad! I miss putting up food for the winter. I’d use the labels for gifting! Mmmm, I have pears, I have honey, I have ginger! Totally making this! I would think that the greener the pears—the more pectin you would have. I would definitely use these on a batch of honey preserved pears this fall! Would be so grateful to win this giveaway. they would be great for labeling my baked honey, butter, cinnamon and sugared pecans. I absolutely love those jars too. cool giveaway. Thanks for the chance. I would use the labels for my dried herbs. Oooo pick me! How exciting of a gift this would be! Love the labels. They would look great on Christmas gift items. I would be giving this to my mom. She loves canning all sorts of goodies, and I think she could put these to good use. I would use them to label things I store in jars. I’m planning to make homemade kitchen gifts for the holidays this year. How nice to have such social labels. I would use the cute honey labels on my home canned goods, especially my honey peaches or my honey vanilla peats. I would use the honey bee labels in my canning most likely! Those are so nice! Thanks for the opportunity! Thanks for the great canning recipes with honey! Everything I have learned up to now had been sugar based. They are soooo beautiful. Visited CannngCrafts and loved their supplies!!! I’d use the labels on anything whether it had honey as an ingredient or not. I love bees, it’s a thing. I love the bee canning labels! 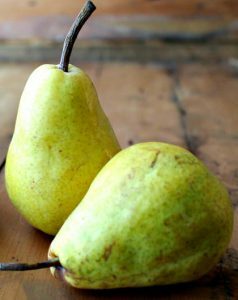 I just bought some beautiful pears at my farmers market and will try this recipe with them. Sounds yummy! Love these–I would use them to label my jars of honey. I love Fillmore Container ! these bee lids are tooooo cute!! I would use the beautiful labels on my canning jars! love the bee! I have made some soap with honey and these labels would be beautiful on the boxes of those special bars! More than likely I will use the labels on Christmas and Holiday gifts. Great time to give pretty jars of preserves and goodies for others to enjoy. Such cute labels! We are GA Tech fans, and I am sure I can use these for a cute packaged tailgate dip holder! I’d use them on anything I’d sweetened with homegrown honey. I have always loved “pear honey.” May have to try this recipe and use the labels for it. I just pinned your honey pear jam and THAT’S what I’d make first. We have tiny jars I’d decant into so it was super special. We have a new local unpastureized honey I’d use! I;d label my honeyed peach bourbon preserves! Actually I would divide up the label sheets and give as a gift whom I know are bee keepers. Excellent recipe and give away! those labels would be great for the gift jams – we all make them. I’m a beekeeper and a maker of preserves sweetened with honey so these honey themed labels are perfect for me. A winning combo of beautiful jars from Filmore and lovely labels from canning craft. How sweet!! 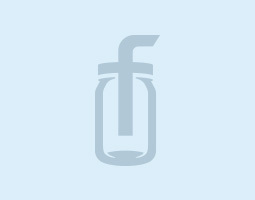 I would label some fruit butter…I think I’ll try the pear and maybe even the fig. I would use those great labels for canning Jelly ! I happen to have a beautiful pear tree all ready to harvest for….’Ginger Honey Pear Butter’ so these labels & recipe are spot on timing for me! I would use these honey bee labels for the local honey I buy in gallon jugs and decant to smaller jars. Definitely making this pear butter. Would love to win the labels. I will put to good use by giving them away doing the holidays. Thank You! The labels are adorable. I use labels for everything. Canning labels are always at hand in my kitchen. I love these labels – I think I would use them on any of my canning – not just honey items! I like the idea of using these labels as an identifier for honey sweetened! It will make it much easier! I’d write what they are and when i canned them. Darling labels! I’d love to use them on our trials of making jams with honey. I would use them on my creamed honey jars. this sounds great! I will be making this on Saturday. Can this be made in a crockpot? Hi Gloria, Most fruit butters will cook down well in a crockpot. You’ll just want to be sure to watch the edges for scorching. I often put the lid on, but place a wooden spoon under the one end of the lid so that the steam can still escape. Of course, you will still have to apply the standard water bath process. I would use these to put on my homemade canned jellies. Thank you for the chance to win – I have my eye on some mason jar lids from your site! Those labels are adorable! I am always looking for pretty labels for my jams and chutneys. The butter recipe sounds delicious! To label my own honey jars of course! I like giving them to family during the Holiday’s. 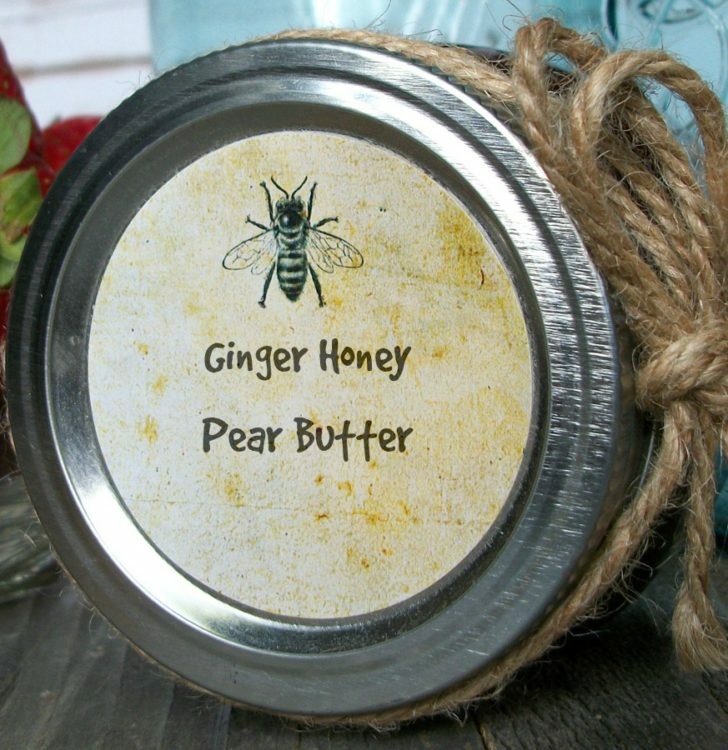 I would use these Vintage Honey Bee Canning Labels from CanningCrafts to try out the Ginger Honey Pear Butter recipe and other recipes using honey. I would use them for my things I can for gifts. So pretty! I would use them on all the jars I can, they are awesome! I’d use them on Christmas gifts of jams, broths or fruit. I wouldn’t have to sign my name since my first name means bee and all my friends know that. I would love to use these Canning labels on my jars of peaches that I will be putting up. They are so cute & fun. I will use them on my Christmas gifts of mixes. Sweet labels! I’d use them any time I made preserves with honey. I just made some honey-peach preserves, and these cute labels would have been perfect for the jars. I would use them on my homemade jams – so cute! And on the bulk honey jars that I get from our community co-op. I would use the labels for my corn cob jelly. It tastes like honey. I love fancy labels and Fillmore container jars! 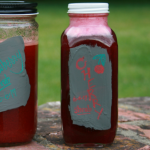 I would do some canning and then use the labels to give the jars away to my family and friends. I’m always getting wonderful home made gifts and would love to give something homemade of my own. Aside from putting them on jams with honey, they’d be good for jars of whipped honey butter, and even for stand alone gift tags. I’d use them on my peach butter that I am giving as xmas presents…thanks! Anything bee is great with me!! I love them! Just saw bee skep towels that would complement each other in a gift ensemble using canning jars. I would use them on my honey apple preserves. I will use them for teacher gifts this fall! Great recipes, information and some FREE stuff! What a fun site. I would use them on my sweet tea poached peaches. I am almost done with my Whole30. I can’t wait until it is done because I am MAKING this! I would use these labels on my apricot, honey and lemon jam! They have been waiting for a label. I’d use them on my honey-sweetened jams and butters! It seems easy enough to swap out the sugar with honey and what could be better for you? I love these labels. Just made some apple pie jam and they would be so cute with these labels! Thanks for this blog post. Always so helpful! I would use these on all my jams, butters, and curds! Much better than the mailing labels that I have been cutting up and using! Cute! ”Tis the season to start making Christmas gifts”. What a great way to identify items made with honey as a sweetener. I am using honey this year with some of my jams. I love these labels. I would use them for salsas, preserves and new recipes I find on Pinterest. I would use them on items I am giving away. I use the ends of address labels, so these would be a huge improvement for all my canned goods! I would use the Vintage Honey Bee Canning Labels from CanningCrafts on my homemade peach jam! I would use these Vintage Honey Bee Canning Labels from CanningCrafts to label jams, various types of honey and jars of baby food. Thanks for the fantastic opportunity to win! Yum! Ginger Honey Pear! What an interesting flavor combo! Can’t wait to try!